RAPCO manufactures FAA PMA approved propeller de-ice brushes for replacement in BFG and McCauley brush assemblies. Our specially formulated carbon compound offers increased service life by reducing wear at altitude. In addition RAPCO products offer a substantial savings over OEM pricing. When replacing modular style brushes you can choose from three options. You can replace just the carbon brushes, the universal brush modules, or the entire modular assembly. Module spacers and terminal spacers are also available. RAPCO offers FAA-PMA replacement brushes for BFG solid style brush blocks. RAPCO offers brush and holder assemblies replacements for McCauley block assemblies. They come with brushes, springs, leads and terminals all attached to an aluminum mounting bracket. There are either two or three carbon brushes per cluster depending on the part number. 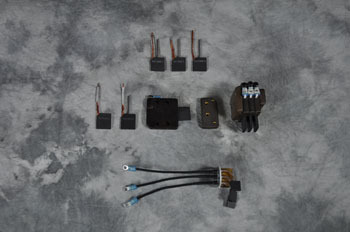 When ordering, it is important to remember that there is one block assembly per engine, and two brush and holder assemblies are required for each block assembly. If the brush and holder assembly has a part number ending in -1 or -2, one of each dash number should be ordered per block assembly.